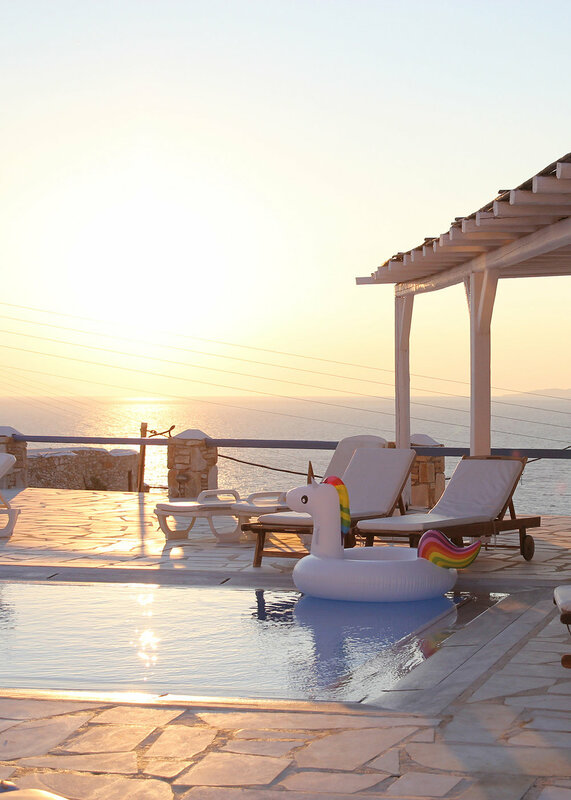 Yes, Mykonos is known as the “party island” – and it is just that – but it is still family friendly. The party-goers start their day when we go to bed, so kind of works well. 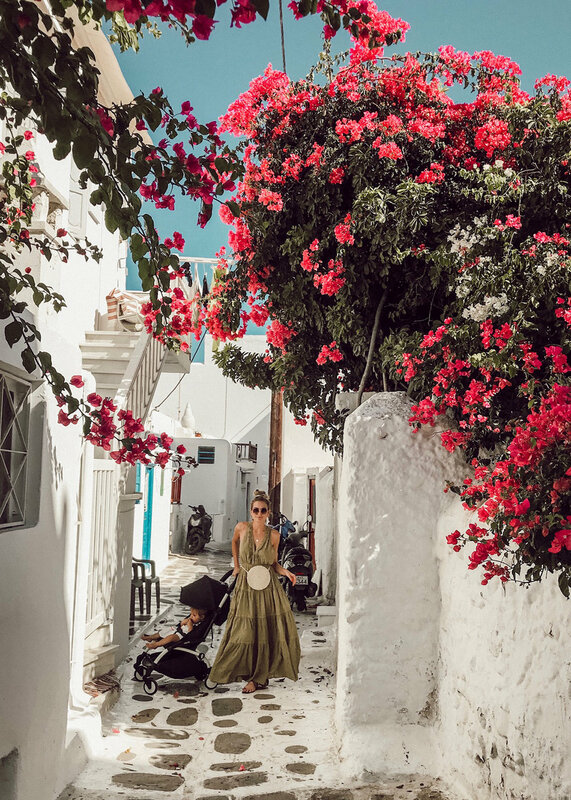 We were tossing up between flying into Mykonos or Santorini, and although Santorini is more visually stunning- we chose Mykonos because it’s pram friendly and the white sandy beaches are best in the heat. With the “party island” reputation I wasn’t expecting too much to be honest- more as a base to fly in and then get the ferry to the more “family” islands, but as a destination on it’s own we found that it’s perfectly great for a family vacay. WE STAYED | Villa Adonis– beautiful, but basic boutique style villas and family rooms. Share pool with 3-4 other villas. The most stunning views over the Agean- sunsets are out of this world. We had a family room with a small kitchen, but mostly ordered food quite easily though the property manager. It’s about 10-15 mins from Mykonos Town and the organised beaches. When we booked it said “5 minute walk to beach” but it’s not an organised beach and it’s down a steep cliff- not a beach you would take the kids to. You will need a car and roads are quite windy and can be a bit tricky to get around. The family room was great, but the 2br villa would have been better. These villas aren’t really toddler-friendly with pool dropping off a small cliff and not secure fencing. Also stairs in villa are a bit of a nightmare for toddlers. FAVOURITE BEACH | What I love about Europe beaches are the umbrella, lounge chair, taverna situation… Seriously, Australia we have the most epic beaches- we need to get onto this stat! Dinner on the beach is perfect when you have young kids. We didn’t explore many beaches, but PLATIS GIALOS this was recommended because no wind and family friendly and crystal waters. It was heaven. The lounge chairs are a little pricey- but totally worth it. Archie declared favourite beach he has been to. FOOD | We only enjoyed two dinners at restaurants, because Poppy is at the “only go to a restaurant if you want indigestion and a fight with your hubby” age- but if you can time a meal out with a pram sleep, it’s definitely worth it. Kiki’s Tavern on the north side of the island is a must for the most authentic food on the island. The long wait is worth it (well depending on how the kids are behaving!) Definitely a little piece of Mykonos. Mykonos town has so many restaurant options. We ate at an Italian restaurant on night and the other grabbed a Gyros and wandered around. NB. Best to have a car if you want to explore the island- taxis are quite expensive and unreliable. Don’t forget your international license!